Diplomat Blades offers the HexArmor Arm Protection AG10009S arm guards designed to offer superior cut resistance and puncture protection in diverse industrial situations. All HexArmor products are engineered to provide users with the highest levels of protection in areas where risk is the greatest. HexArmor arm guards are designed to offer high performance, durability and comfort, providing industrial-level puncture protection while working with wires, metal, wood and glass. The protection is provided over the entire forearm. The protection offered by the arm guards will also reduce the need for safety equipment in the workplace. HexArmor Arm Protection arm guards prevent snags, punctures, abrasions and cuts to the forearm. HexArmor products incorporate the Science of Safety to help reduce injuries and lower PPE costs in harsh work environments. The arm guards are made from SuperFabric brand material for high cut resistance exceeding ISEA/CE Level 5. 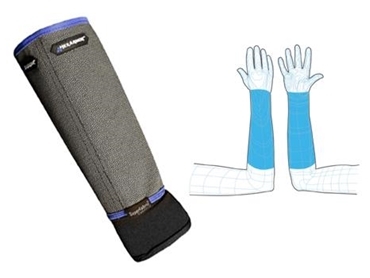 Additionally, arm protection guards offer several competitive advantages such as lightweight and cooler properties as well as long-term durability. The safety arm guards will not fall down like knit sleeves. A Spandex wrist insert is provided with a thumbhole. The cut-resistant arm guards can also be laundered. Typical applications of the puncture protection arm guards include glass, metal and wood handling work, assembly work as well as food packing and processing work.